The Self Storage Association reports that almost 11 million Americans keep personal or business belongings in a self-storage unit. Unfortunately, thousands of these storage units are abandoned every year, as is documented on a reality TV show. 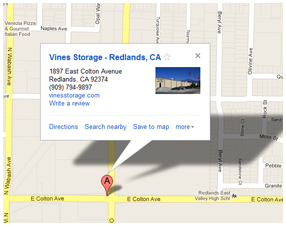 When you think about what you intend to place into our Redlands facility, you know that your items are kept in a secure environment. Vines Storage is not your average self-storage solution; it is housed behind high walls and security cameras. However, the need for adequate insurance coverage for stored items is still there. The first question to ask is whether your standard homeowner’s insurance policy or renter’s policy will provide protection for property not located at the home where you reside. Most standard policies do this, but it is always good to double check. It is also important to determine the exact type of coverage that applies to items in storage, as most policies do not provide the same coverage for such items. The wording in an insurance policy is of importance for items kept in storage. Some policies may provide only a fraction of coverage for items located outside of the home, as low as 10 percent of the total coverage amount. This is commonly called a coverage limit. Therefore, if you were to have a $100,000 limit in your homeowners or renter’s policy, those items in storage would be covered only up to $10,000 if the coverage limit were 10 percent. Items that might require a separate policy include cars or recreational vehicles. Most motorcycles, ATVs, boats, cars, and other recreational vehicles are not covered by a homeowner’s policy when not in storage, but are covered elsewhere. Once in storage, there are very few exceptions in which insurance coverage is provided in a standard policy. Other items that may need to be covered separately include collected art pieces or antiques. These valuables are usually better placed on their own policy, whether at home or in storage. Whether it is a collection of antique plates or your father's old record collection, insurance can be a beneficial provision. Before placing items into storage, take inventory and make a spreadsheet catalog of items contained within your unit. This list can come in handy when obtaining the necessary insurance coverage for items kept outside of your home. Contact us to tour our facility or choose your climate-controlled storage unit.